Gamers take on the role of the only surviving member of an elite special forces unit searching for a secret underground lab. Gamers may take on the mission alone or fight side-by-side with a friend in the two-player cooperative mode. “Assault Heroes” puts players into a heavily armed 4X4, maneuverable speed boat or trusty military-issue footwear, blasting their way through enemy-infested territory while being assaulted by waves of formidable enemies with unrelenting attacks. Multiplayer co-op mode – Two players may play co-operatively online via Xbox Live or offline (same screen) with enhanced weapons and special attacks to encourage team-based campaigns. Dynamic gameplay – Operate an armed 4X4, speed boat or simply fight on foot for a quick change of pace. Arsenal of weapons – Equip characters with miniguns, flak cannons, flamethrowers, grenades and nukes to destroy everything in your path. Realistic special effects –Destructible terrain and advanced physics engine provide a truly engaging Arcade experience. Highly detailed graphics – Vehicles leave tracks in the sand, send parts flying when they explode, and leave smoke trails when taking damage. Exhilarating Action-Packed Experience – Challenging and graphically compelling levels (including bonus sublevels) for fast-paced and addictive play. Finish a zone without losing a life. Finish a zone in Co-op mode. Finish a zone killing 60% of the units on foot. Finish a zone in less than 15 minutes. Busting out the putter in ghost towns, outer space or at the carnival from the comfort of your couch has never been so much fun. “3D Ultra MiniGolf Adventures” from Sierra Online will be available for download on Xbox LIVE Arcade for Xbox 360 beginning Wednesday, April 18 at 0900 GMT (2 a.m. PDT). From the creators of the popular Xbox LIV.. Swing back into action with 3D Ultra MiniGolf Adventures 2, jam-packed with more holes, more fun and more minigolf hysteria! Score perfect hole-in-ones as you putt through 54 mind-bending holes in three outrageous themes. Play through the Haunted Manor, Manic Museum, Winter Wonderland or dare to create your own wacky course. Use a variety of silly .. Define your legacy. Awaken your inner beast. Fight as one of the three powerful warriors of Artemis as you confront Gorgon herself in Arkadian Warriors. Embark on a trek of epic proportions, traverse treacherous dungeons, fight off hordes of hideous enemies, and take on heinously powerful bosses. You must save the goddess Artemis and return the myt.. The sequel to the award-winning Xbox LIVE® action extravaganza, Assault Heroes™ 2 continues to ramp up the excitement. Your original enemy was just a pawn of a more sinister alien force, and now you must fight on both land and in space to overcome this new threat. Fight alone or work with a friend in the enhanced two-player cooperative mode. Employ..
Set in the near future, TimeShift from Saber Interactive will take the first-person genre to an entirely different dimension marked by erratic time and unrelenting action. The unprecedented technology behind TimeShift will allow gamers, for the first time, the ability to slow, stop and reverse the flow of time while remaining completely unaffec..
3-2-1 blast off! Launch yourself into the intense space-shooter Aces of the Galaxy™, a non-stop, old-school arcade thrill-ride for the twenty-first century and beyond. Utilize an impressive arsenal of upgradeable weapons including high powered missile launchers, devastating torpedoes, and the ever-reliant chain gun to annihilate the ships of the wr..
Battlestar Galactica is based upon the Sci-Fi Channel television series. Enter the Battlestar Galactica universe in Battlestar Galactica™. 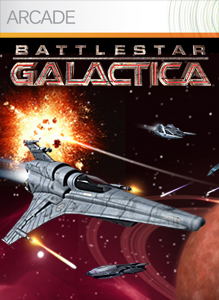 Sign up to defend the Galactica, or play as the ruthless Cylons as they seek to remove the Human Race from existence. Pilot iconic ships from the Viper II to the Heavy Raider and lead your squadron in eno..